The boys were anxious for this year's summer reading kickoff party since they had so much fun at last year's kick off event. We knew the same company was coming with animals again this year but this year we found out he was teaching us about animals found in our community and surrounding areas. We got to learn about new animals this time around though and the boys learned a lot about local animals. We saw tree frogs, talked about the life cycle of a frog, toads vs. frogs, peeper frogs, and camouflage. We learned about flying squirrels and I had no idea that they were more prevalent than gray squirrels in our area but they're nocturnal so we don't see them as often. We talked about their skin flap, their flat tails and their coloring. He brought his skunk "double stuff" with him. We got see their claws and teeth up close and Alec was thrilled to FINALLY be called on to explain why their eyes are not large like a flying squirrels. Alec was having hard time not taking over and blurting out animals facts but I saw with him and kept reminding him to give others a chance to talk too and not to interrupt. He was just so excited! We saw a groundhog up close too. They have huge teeth; much like a beaver and Evan could not resist telling about the time we saw a groundhog chasing a cheetah at the zoo. 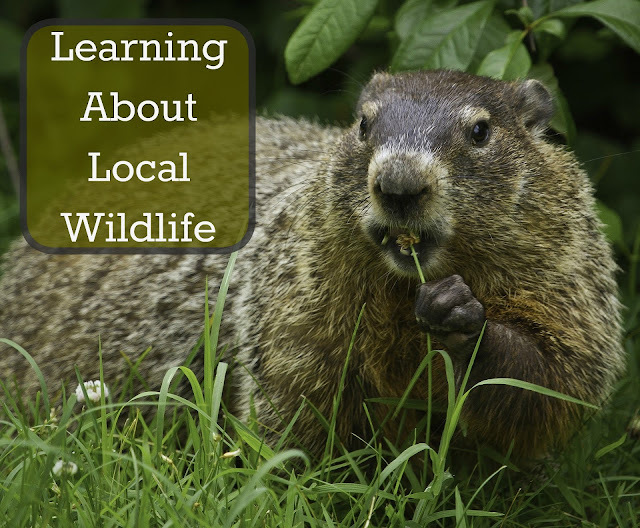 The man explained that many animals are afraid of groundhogs because of their sharp teeth. We learned about their burrows, how they dig them, and where they like to live. He had painted turtles and snapping turtles, though the snapping turtle looked so much different from the ones we're used to seeing at our house. He talked about the colors of turtles, why they sun themselves, what they eat, where they live, and where they like to lay their eggs. He had a fox with him. Alec was really impressed to learn that the fox can climb trees! Though reddish in color it's not a red fox it's a gray fox (since the back of the fox is gray). After he cleaned up after the fox he had one final animal to show us-- a fisher. And while it's often called a fisher cat it's actually part of the same family as skunks and ferrets. I have to say he was kind of cute looking! But we did get to see his nice big teeth and large paws. They like to swim, climb, dig holes in the snow, and, unfortunately, eat house cats. They will not hesitate to tackle an animal larger than themselves. Fond memories of trips arranged with Alley Pond Environmental Center. We just love learning about animals and nature!